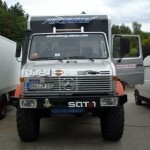 Back in 2010, Mercedes-Benz prepared this expedition camper for the annual Abenteuer & Allrad show in Bad Kissingen, in conjunction with specialist truck and camper shop Bocklet Fahrzeugbau in Koblenz. 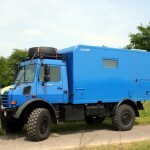 Based on the Unimog u4000, the vehicle had an advertised price of €248,300 ($307,296 USD). 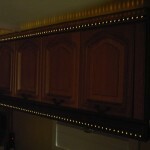 It’s a gorgeous piece of kit, and almost all of the credit goes with the professionals at Bocklet who built it. 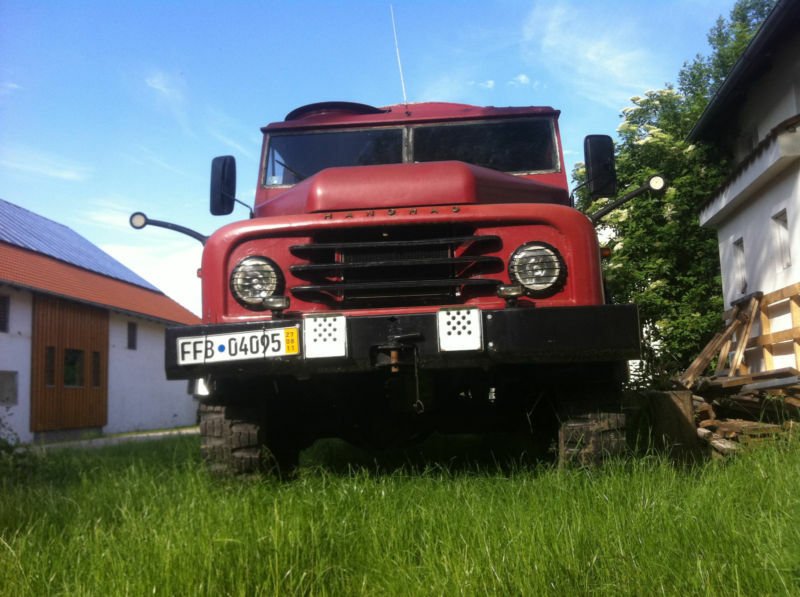 You can buy your own version, known as the Dakar U685 directly from them. I know this is old news, but I thought you might like to see it. 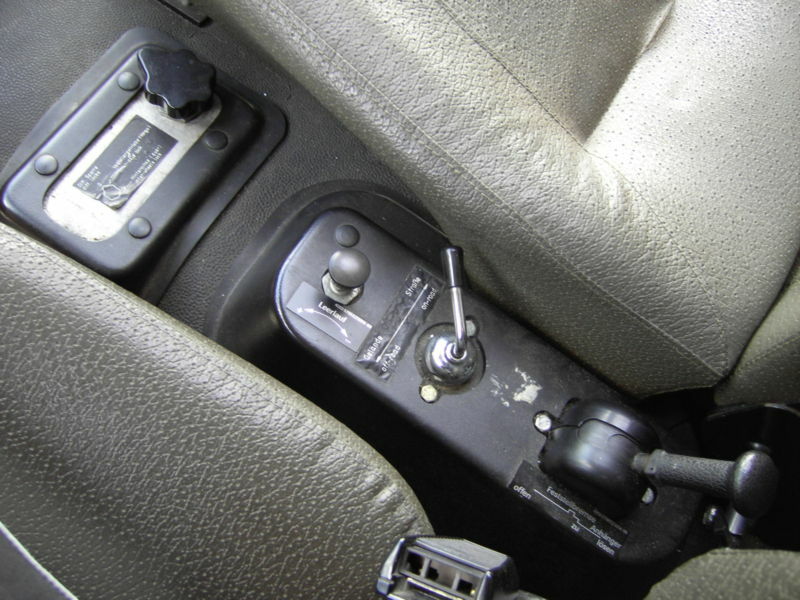 Also, if you troll around to some of the more general automotive press sites that posted about this back in 2010, be sure to read the comments, they’re usually hilarious. 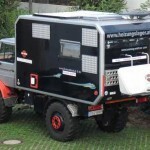 Stuttgart – An expedition camper based on the Mercedes-Benz Unimog – the dream of every bona fide globetrotter. 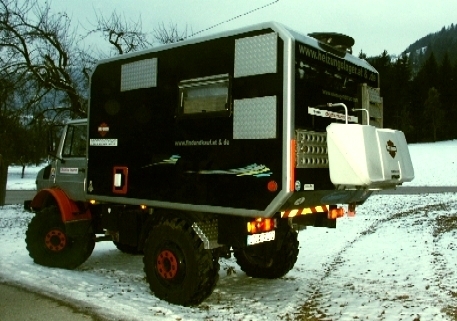 At this year’s “Abenteuer & Allrad”, Europe’s largest off-road vehicle show, the expedition camper will be on display in Bad Kissingen from 3 to 6 June 2010. 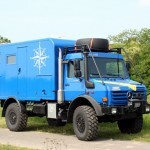 Michael Bocklet from Koblenz and his team have built a fully fledged go-anywhere vehicle based on the UniversalMotorGerät (Universal Motorized Unit), to give the Unimog its full name. 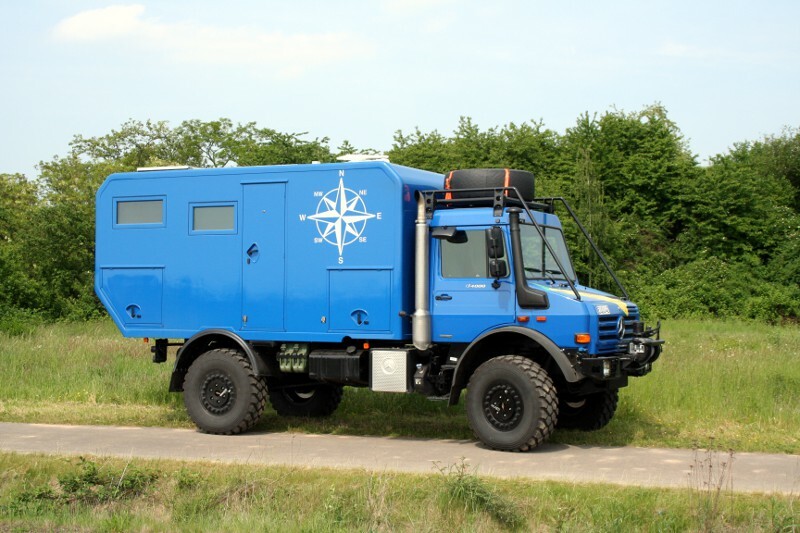 The distinctive Unimog U 4000 with its Bocklet body is the archetypal expedition vehicle – the consummate solution for even the most ardent adventurer. 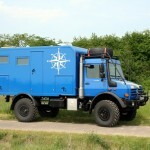 The U 4000 is the perfect expedition vehicle thanks to its absolutely unique chassis concept. Portal axles deliver excellent ground clearance and ensure constant road contact of all four wheels. The suspension with torque tube, transverse links and coil springs allows long spring travel and superb axle articulation – supporting diagonal axle articulation of up to 30 degrees. 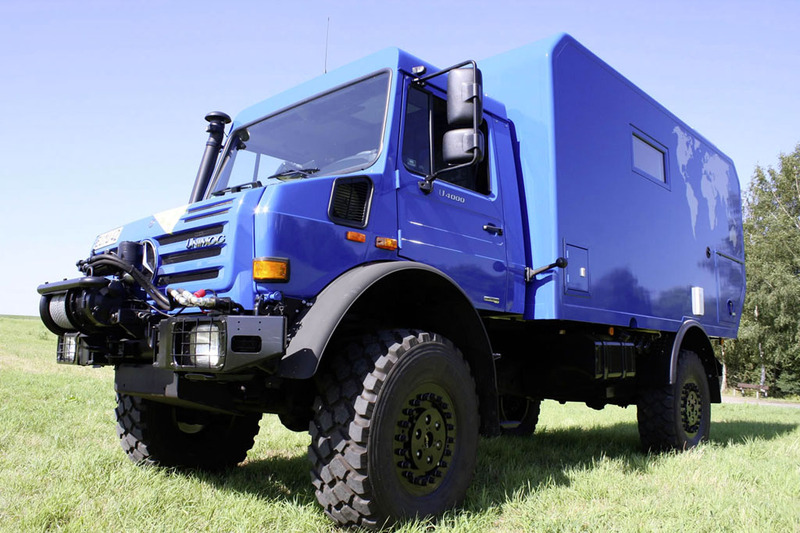 In conjunction with the short frame overhangs, the Unimog also effortlessly takes difficult obstacles, hilltops, slopes or embankments in its stride. 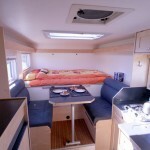 Waterproof major assemblies and an air intake pipe level with the cabin roof ensure a fording capability of 1.20 metres. 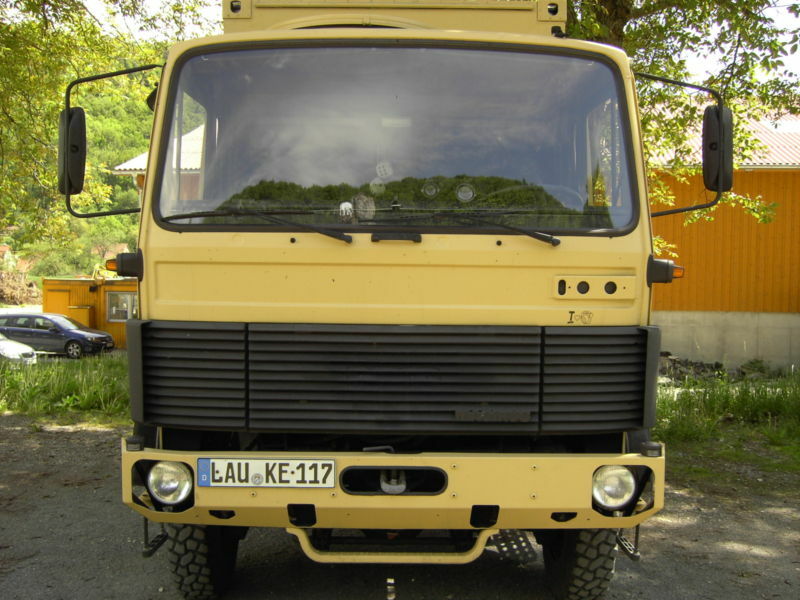 The Unimog comes with single tyres (as opposed to the twin tyres on an all-wheel-drive truck), thus offering high traction with low rolling resistance. 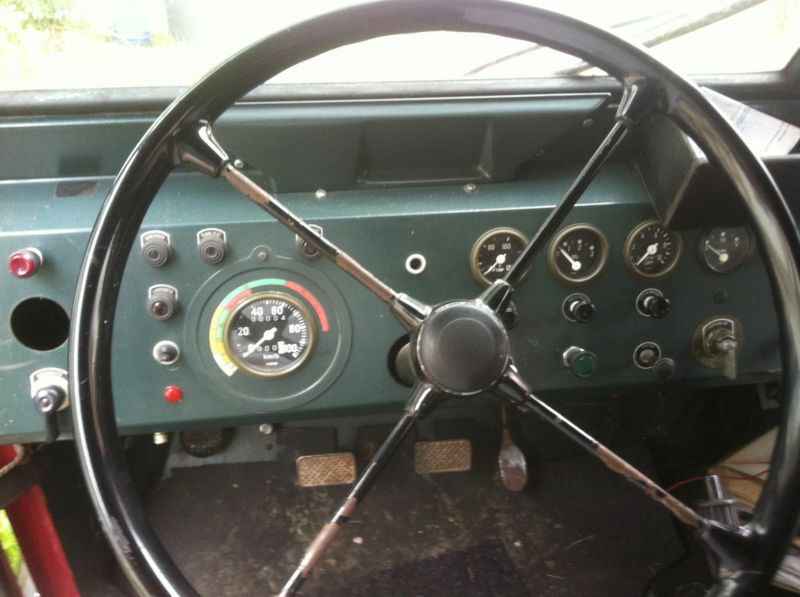 The tirecontrol tyre pressure monitoring system can be used to reduce the tyre pressure conveniently from the driver’s seat while on the move and so ensure the wheels do not get bogged down on soft ground. 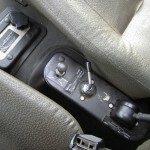 This technical feature improves traction and power delivery. 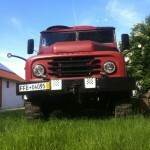 The 4249-cc four-cylinder diesel unit produces 160 kW (218 hp). 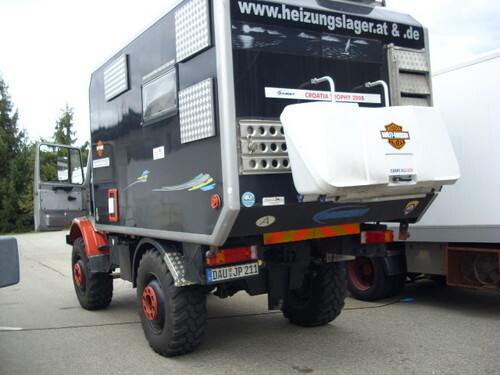 The permissible gross vehicle weight of the all-wheel-drive vehicle (wheelbase 3850 mm) is 7490 or 8500 kilograms respectively. 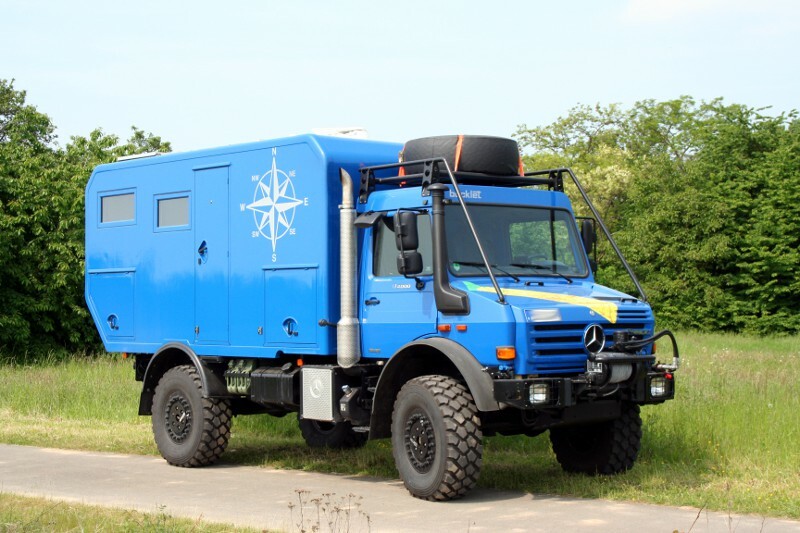 In conjunction with the all-wheel drive and differential locks on the front and rear axle, the Unimog is the ideal solution for a superlative off-road expedition vehicle. 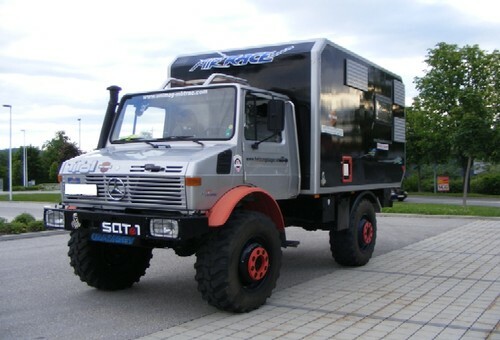 Should it – in the very unlikely event – get stuck, the Unimog can use its hydraulic seven-tonne front winch to pull itself out of the quagmire with its “own hair” à la Baron Munchausen. 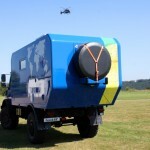 However, you are much more likely to find it using the winch to pull out other vehicles from difficult situations. 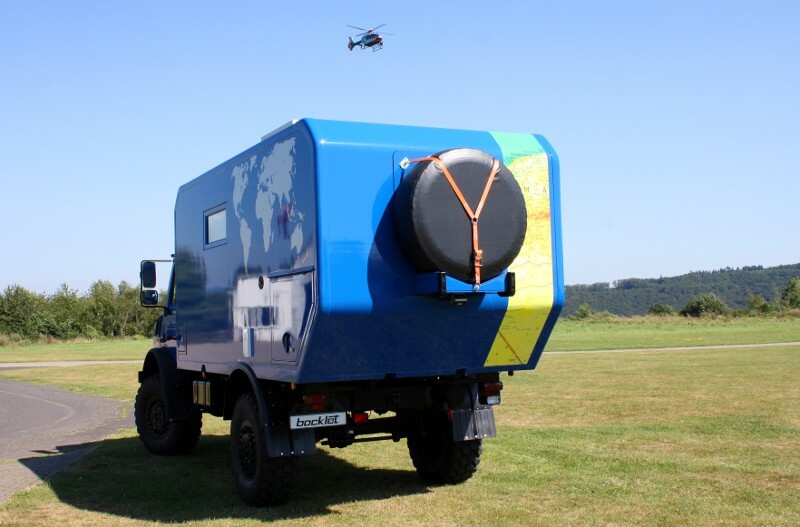 A diesel tank with a capacity of 290 litres (plus two 20-litre reserve canisters) also makes longer journeys less nerve-racking where refuelling is not an option. 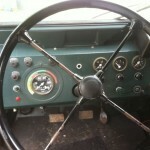 The comfort seats in the cab provide an ideal fatigue-free solution for these arduous stages. 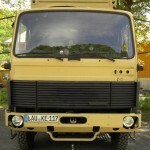 The rear of the Bocklet accommodation module is tapered at an angle to retain the Unimog’s full off-road capabilities. 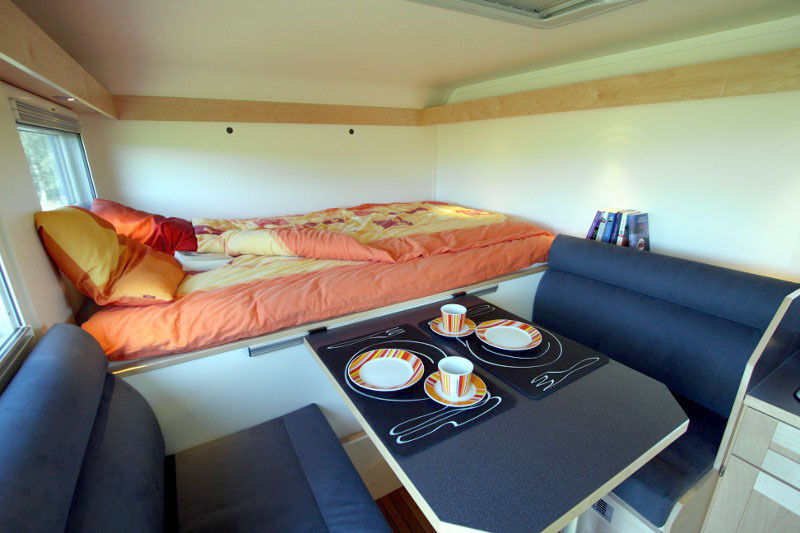 The inside of the module measures 4.35 metres long and 2.20 metres wide (standing height 1.95 metres). 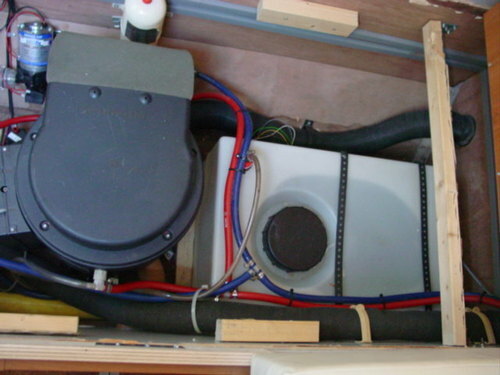 The roof and walls of the three-point mounted, thermal bridge-free fibreglass-reinforced plastic box are 50 mm thick, standing on a 60-mm-thick floor. 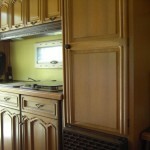 All the walls are finished with a 2-mm-thick fabric-reinforced outer layer. 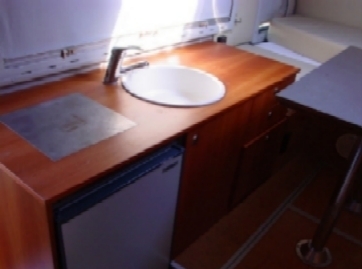 The hatches and doors all come with hollow rubber seals and multi-point locks, which help protect the stowage compartments against the ingress of dust or water. 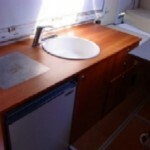 Behind the driver’s seat is the accommodation module washroom, fitted out with a cassette toilet, wash basin and shower. 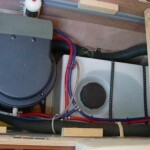 Hot water is provided by a combined Truma gas/electric boiler with a capacity of 10 litres. 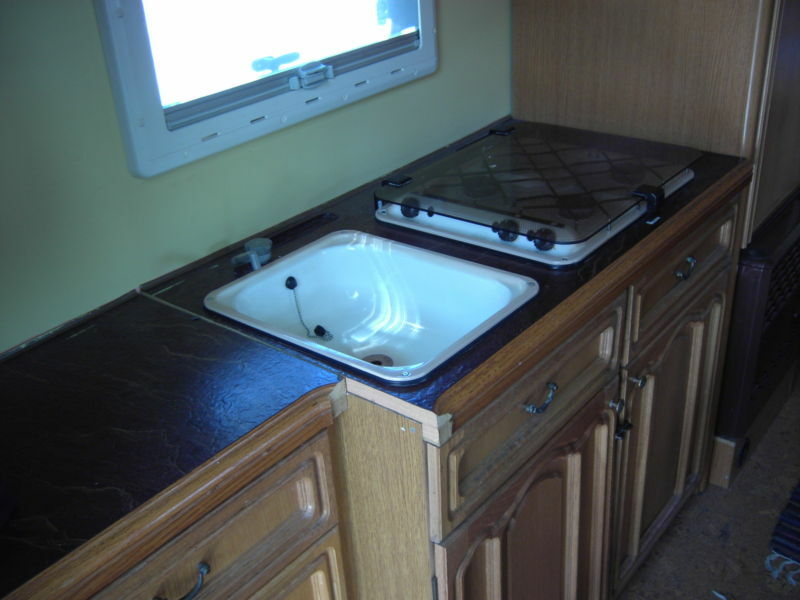 The corner kitchen is fitted towards the rear and comes with a two-burner gas stove, sink and drainer. 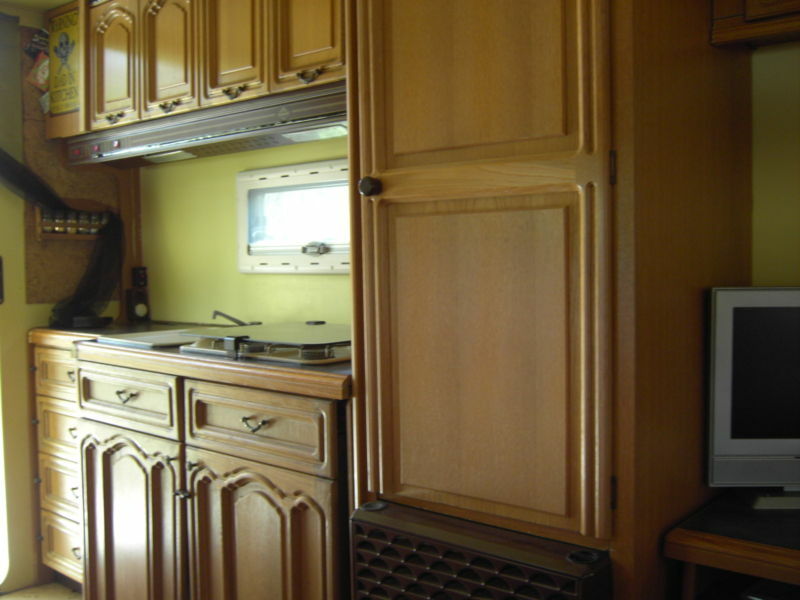 A (lockable) passage leads to the cab, with a wardrobe fitted on the right behind the co-passenger seat. 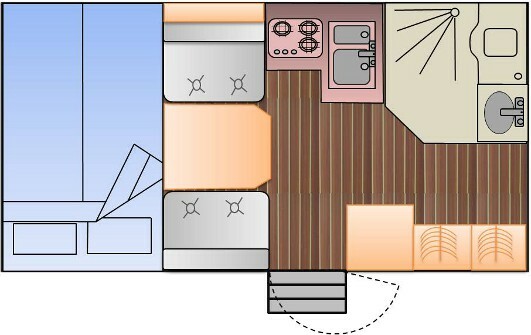 The 110-litre compressor fridge occupies the space up to the entrance door. Benches arranged longitudinally to the direction of travel provide two seats with exquisite Alcantara® upholstery. 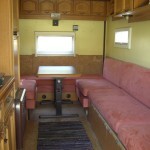 Tanks and additional stowage space are housed under the dinette in the false floor. 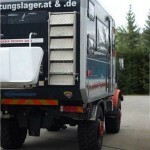 The Unimog carries around 300 litres of fresh water on-board, along with a waste tank holding 200 litres. 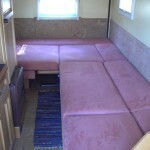 The entire rear area is home to a 200 x 135-cm double bed. 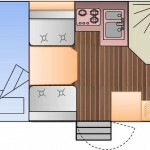 Additional stowage space, which can be accessed from outside, is provided under the bed. 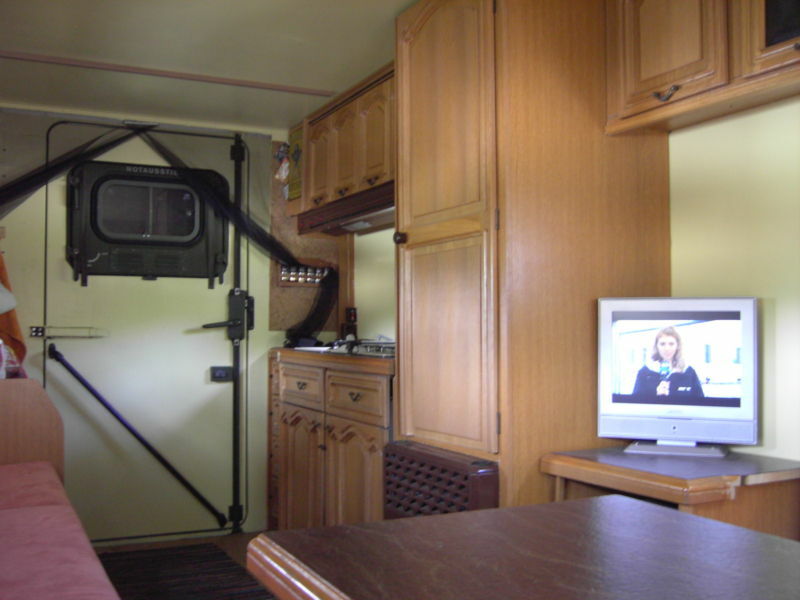 A diesel-powered Eberspächer hot air heater ensures a comfortable night’s sleep in colder climes or during the winter months. 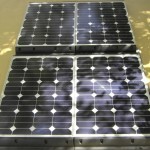 To ensure sufficient ‘juice’, Bocklet has installed 220 Ah of battery capacity, backed up by 260-W solar panels, an automatic charger (24 V / 50 A) and a 1.2-kW inverter. 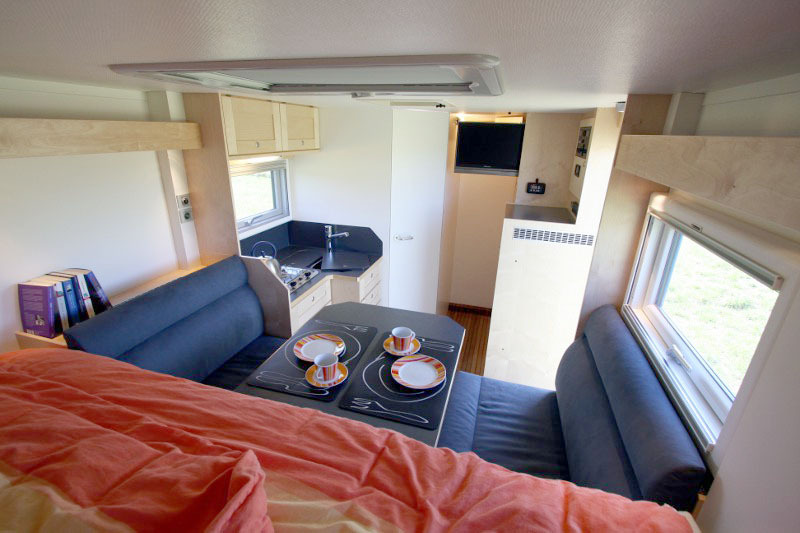 A control panel with an ampere-hour metre monitors the power system; minimal energy consumption comes courtesy of the low-energy lights and LED spots fitted in the interior. 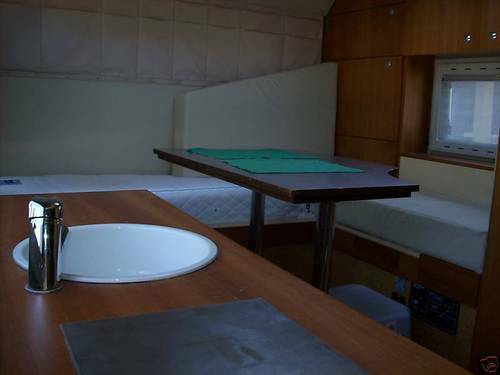 There is a TFT television plus satellite dish and a DVD player for entertainment and information during the expedition, no matter how far away from home you venture. 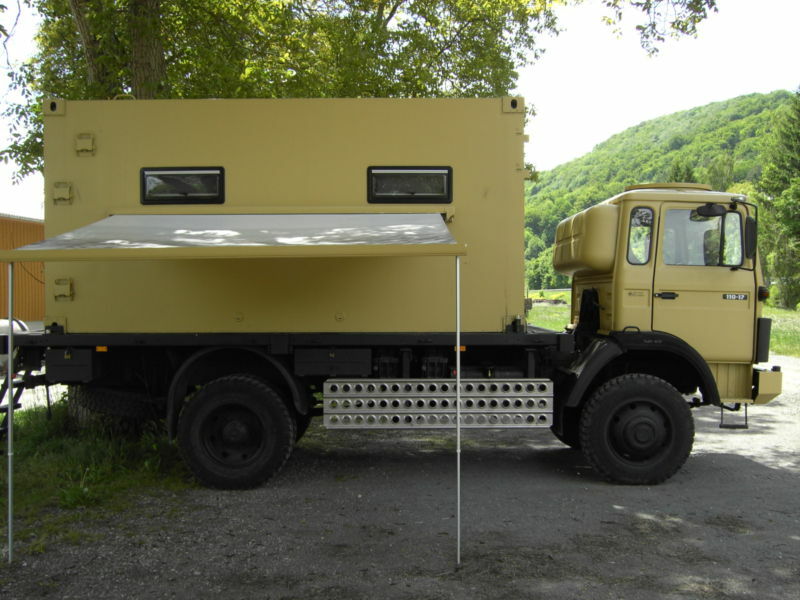 The 6.85-metre-long, 2.35-metre-wide and 3.50-metre-high expedition camper based on the Mercedes-Benz Unimog U 4000 costs EUR 248,300. 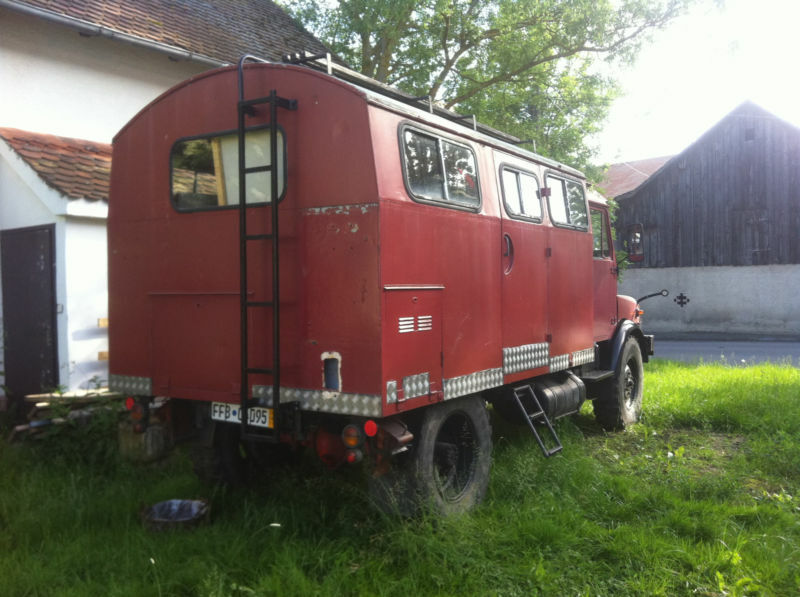 Here’s a nice looking Iveco Magirus 110-17 all wheel drive camper with a Zeppelin camper box that popped up recently on eBay Germany. 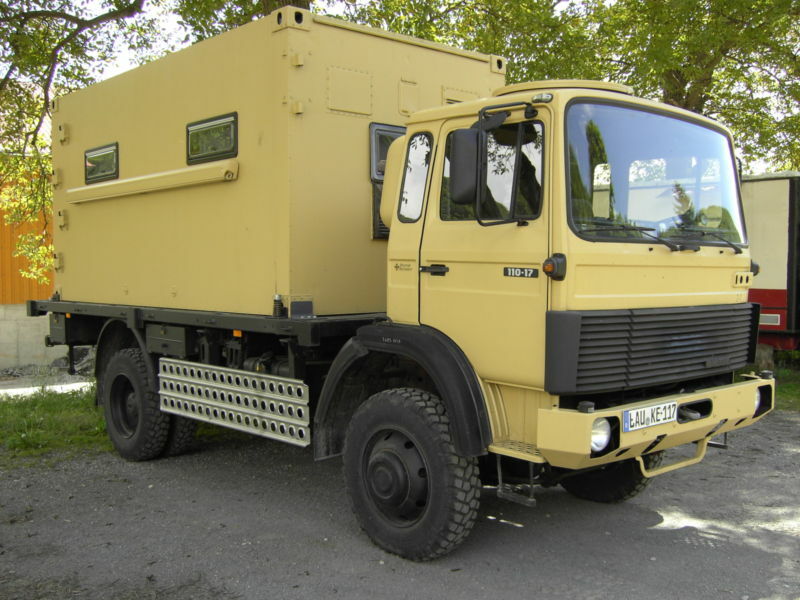 The Iveco Magirus chassis features a 169 horsepower, air-cooled Deutz 6 cylinder turbo, full time AWD, and longitudinal and transverse differential locks. 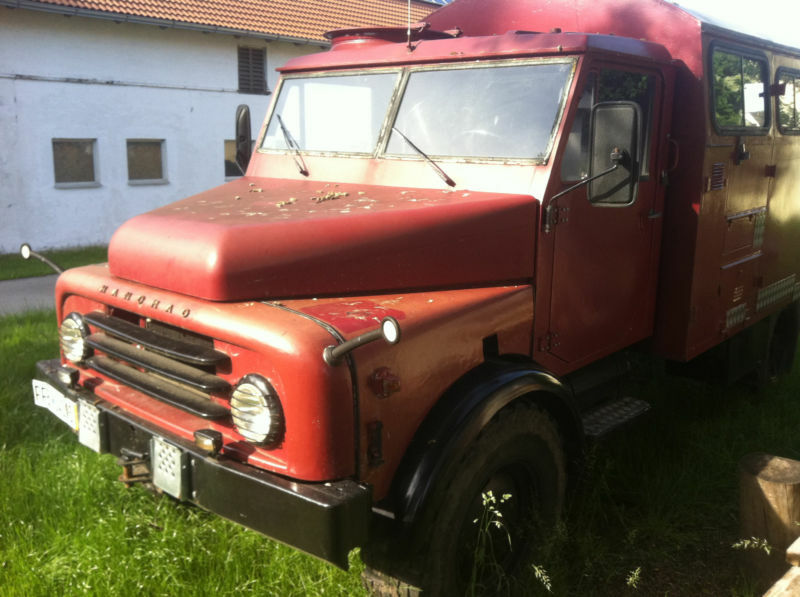 Since it’s listed as an Iveco Magirus, not a regular Iveco, I have to assume it was a fire truck in its previous life (always a good sign; meticulous maintenance, low miles). 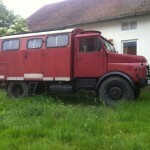 The seller claims the whole thing, fully loaded weighs 6.9 tons (metric? If so, that’s ~6.8 imperial), and drives perfectly. It’s currently at €10,052 ($12,556 USD), with 26 bids, but the reserve has not been met. 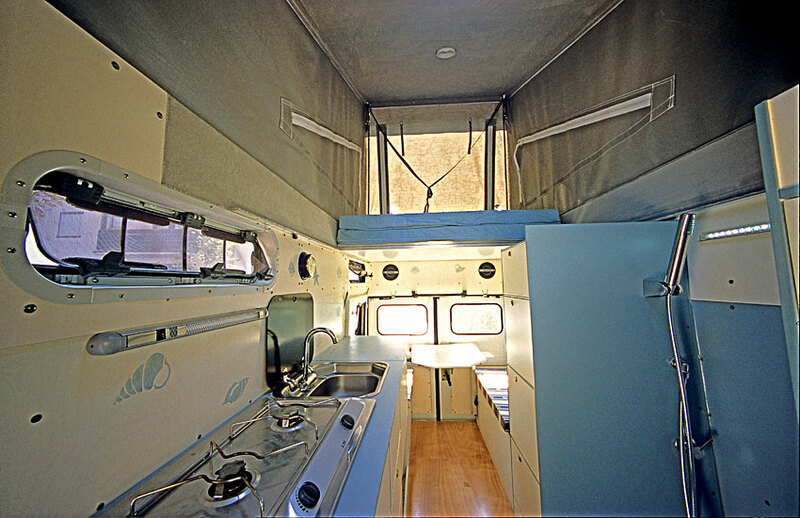 The camper box, built by Zeppelin Mobile System GMBH features the usual fridge, cooktop, toilet, and shower, as well as a heated cork laminate floor. 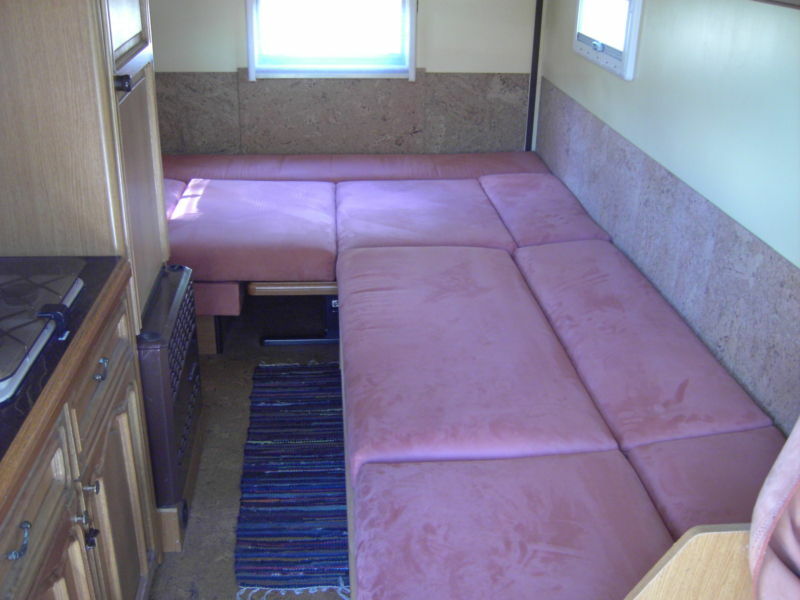 The lightweight furniture is newly upholstered in Apricot microfiber, and was salvaged from a Hobby caravan. 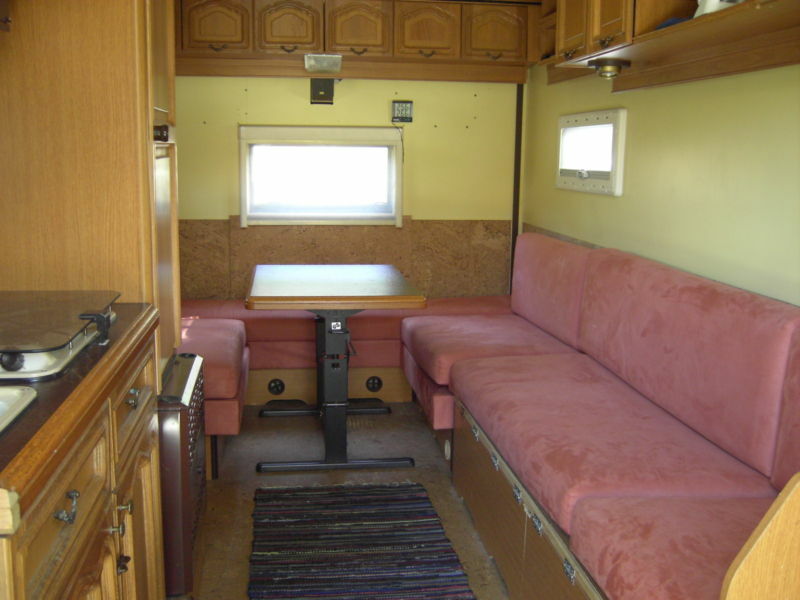 Looking at the photos, the layout looks quite comfortable and roomy, although the interior colors would have me reaching for my paintbrush. 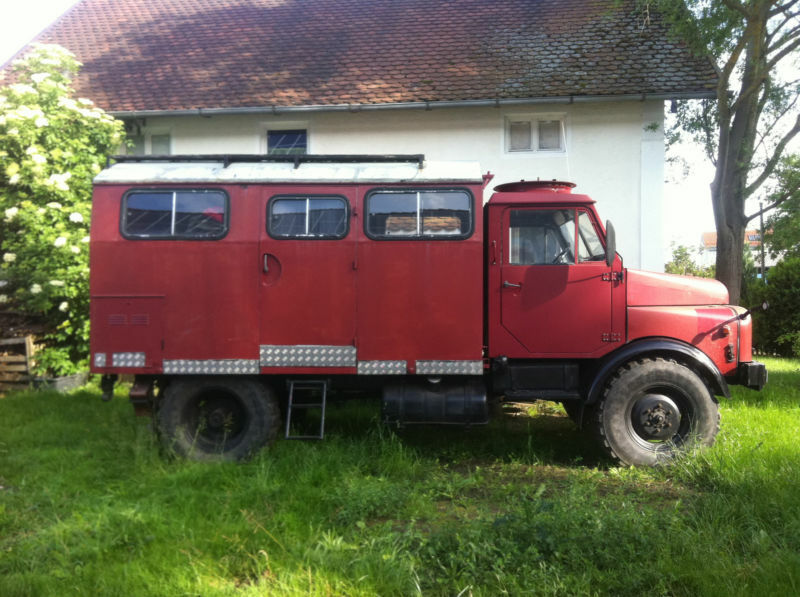 The seller says it sleeps three. 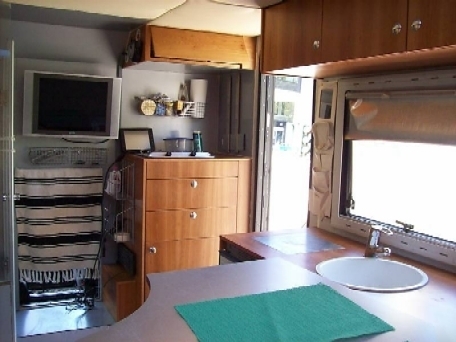 Outside you’ll find storage lockers, sand ladders, a nice Fiamma awning, and four new Seitz windows with roller blinds and mosquito netting. 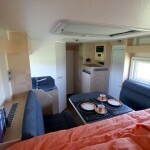 You’ll also notice the glaring lack of a connection between the cab and the camper, on the upside you could store more than a few spare tires and gas cans in that space. 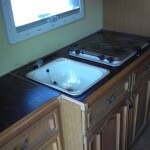 A lot of work seems to have been done to really make the electrical system shine. 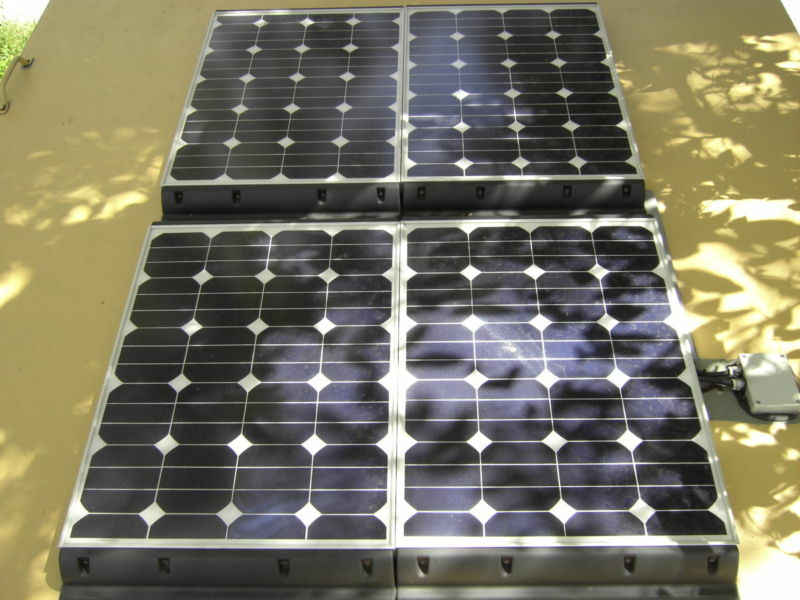 The rig has 240 watts of solar panels (or FOUR 240w panels, my translation had trouble with that), and a Voltronic controller feeding four 100AH Hawker gel cells and a Fraron 220v 3000w inverter. 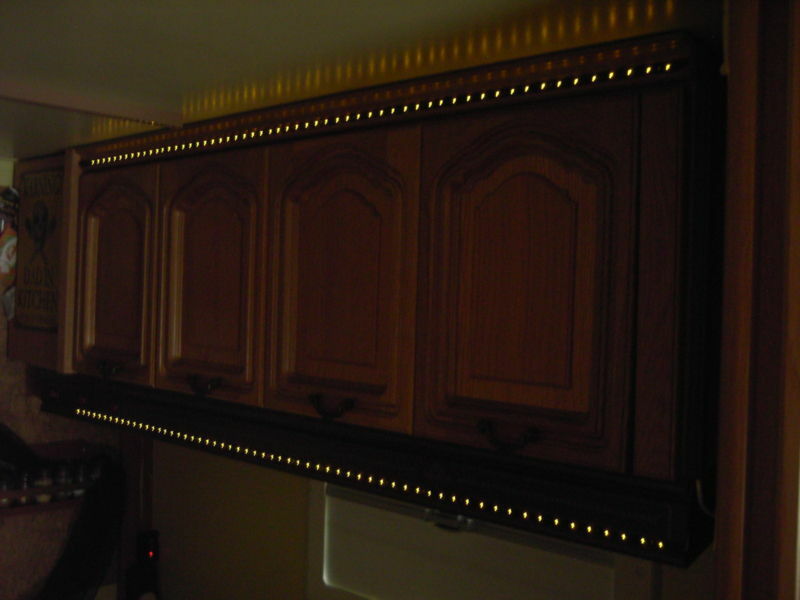 Inside you’ll find LED spotlights and indirect LED strip lighting, you’ll also be able to plug in your 220v appliances inside or out. 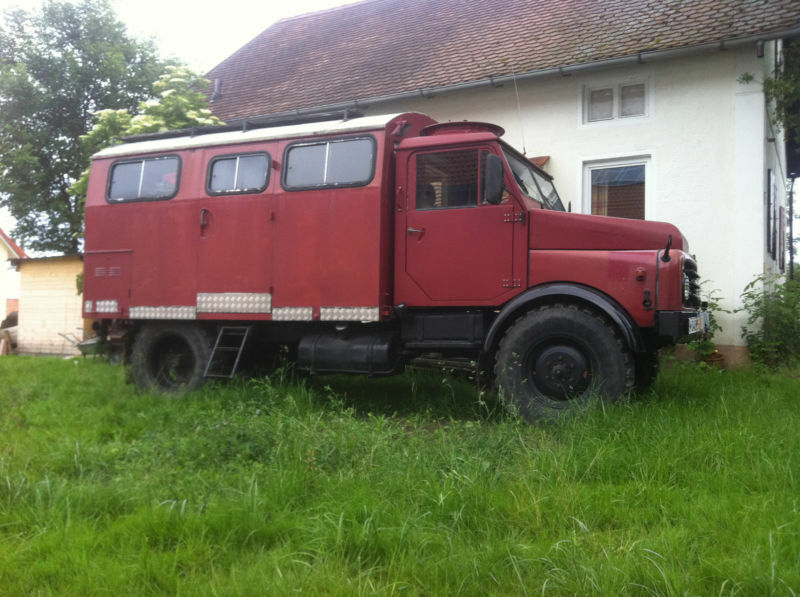 This one keeps popping up on eBay with a listing price of €49,980 ($62,669.92 USD), with no reserve and no bids. 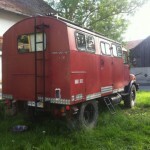 It was professionally converted by Friedl & Webber Camp OEG in Graz, Austria, and sleeps 4. 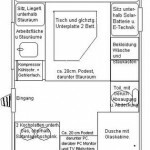 The seller claims that the rig was virtually rebuilt from the ground up during the conversion in 2006-2007, at a cost of over €130,000 ($167,000 USD), which makes the current listing price seem like quite a bargain. 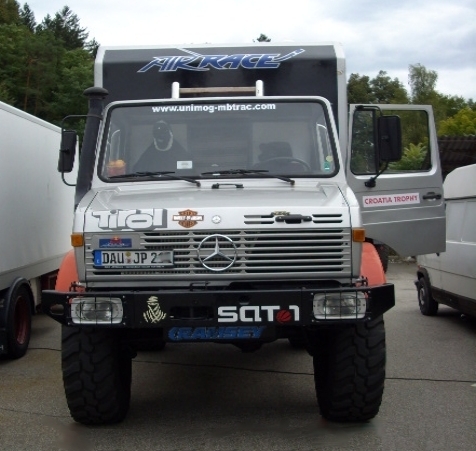 It’s rather quick for a Unimog, with a claimed top speed ‘well over’ 100kph (62mph), and a cruising speed of 90kph (~56mph), some of which is attributed to the oversized tires. Fuel consumption is typically 15 to 17 liters per 100km (15.9 to 13.8mpg), and drops to 20l/100km (11.7mpg) when fully loaded and cruising. 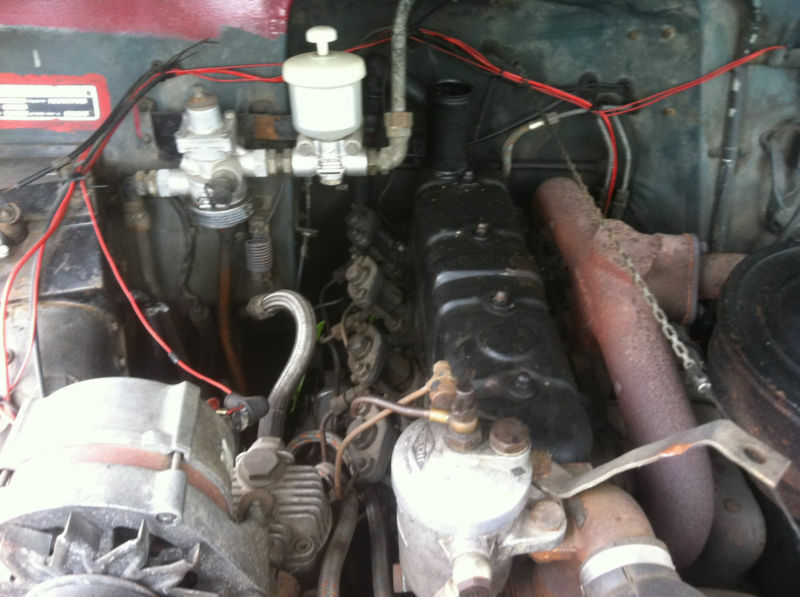 There are also new updates in this newest model, regarding the application of Spray Foam Insulators to refrigerate the truck, and to help the truck stabilize the general structure and since the structure is stiffened the vehicle makes much less general rattling noises. 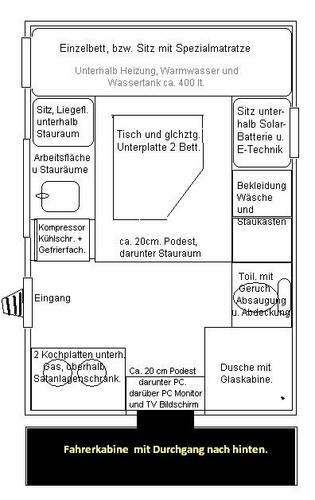 See more photos and read the entire description (auf Deutsch) on eBay. While I’ve seen pictures of the new Bremach T-Rex, I really didn’t know anything about the company or their previous vehicles until today. 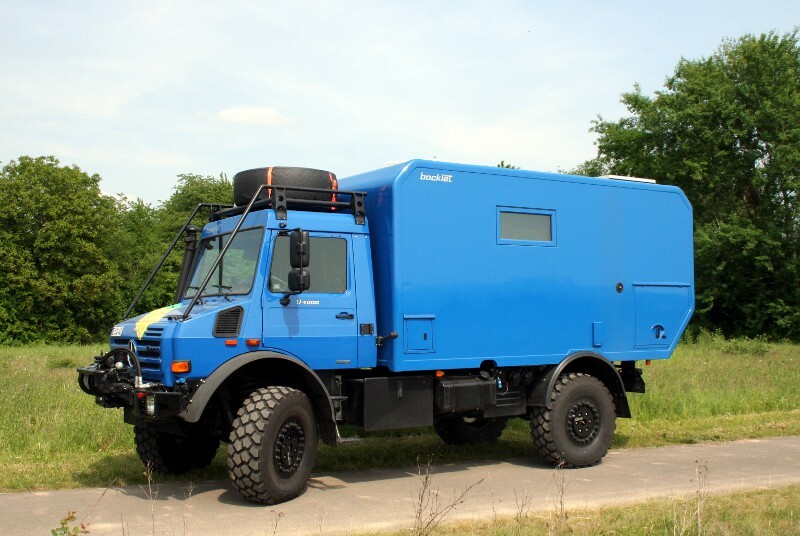 The Bremach X4, and Xtreme are 3.5 ton off-road trucks, available in a multitude of industrial versions, including the great-looking van body shown here. 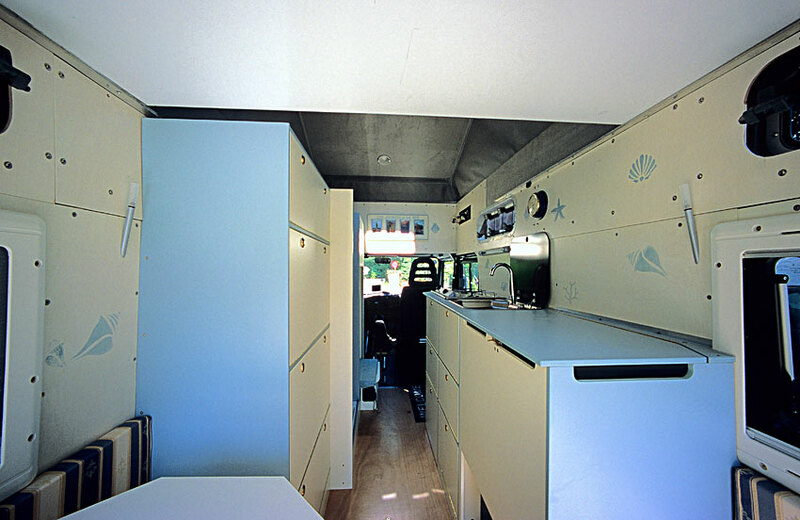 The van seems to be around the same size as a low-roof Sprinter, but the chassis is much taller and is designed for heavy-duty off-road use. 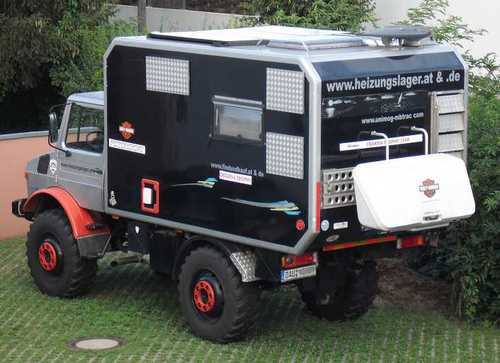 Apparently, they make amazing mid-sized off-road campers. 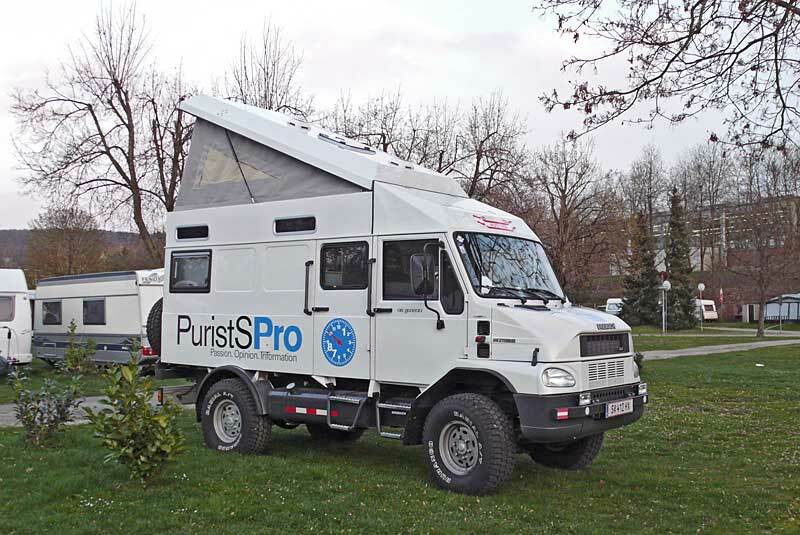 Marcus Hanke from Salzburg, Austria built up a marvelous looking Bremach van in late 2007, and recounts his shake-down adventure through Romania in a great three part blog post on the PuristSPro website. 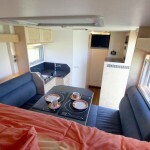 His series of articles are a fantastic read for any virtual tourist interested in Romania, and a wonderful introduction to Romania for adventure motorhome travelers. 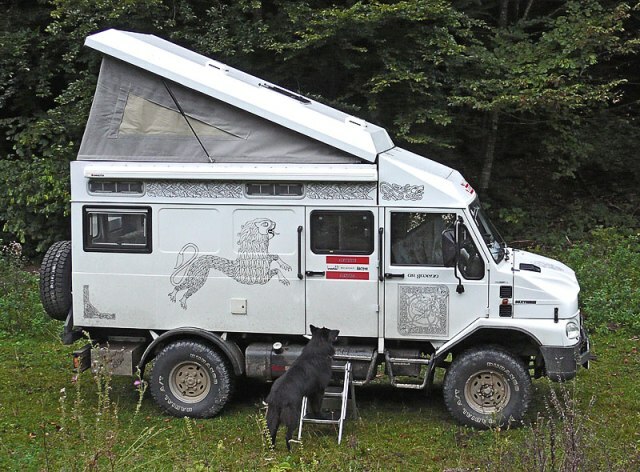 Beyond the travelogue, here he describes the truck itself, and his reasoning behind the decision to go with the Bremach Xtreme. 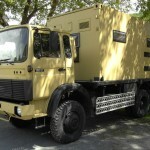 The solution was the acquisition of an Italian light truck, a Bremach. 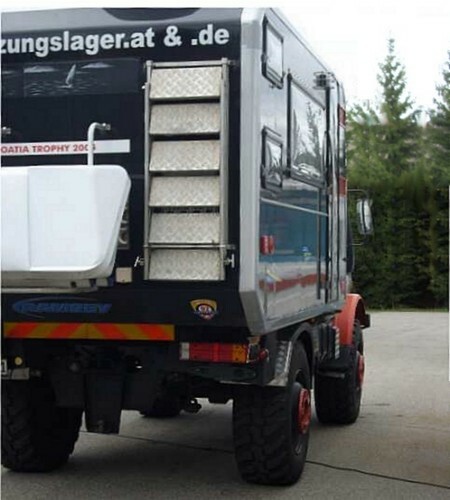 This small company, located in Brescia, near the Garda lake in Northern Italy, has specialised on the production of compact, but highly robust and off-road capable trucks, that are needed for narrow tracks in the Alps, and the passage through small, medieval villages and towns. 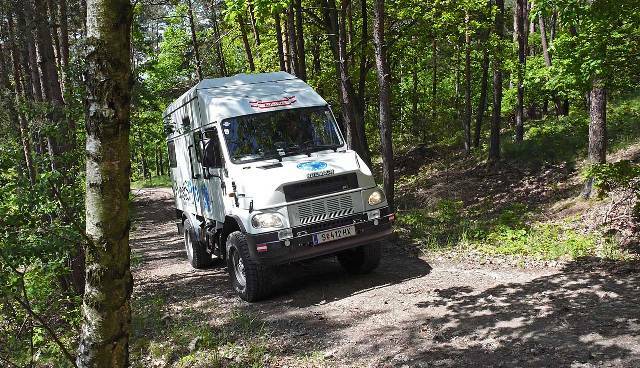 With only 1.7 meters width and about 5.5 meters length, these trucks are able to pass through narrowest gaps in forests and mountains, a permanent four-wheel drive with 28 speeds to shift, full array of diff locks, large tires and a standard Iveco truck diesel engine, with a gross weight that still remains below the legally important limit of 3.5 tons, the Bremach Extreme is the perfect base for a travel vehicle. 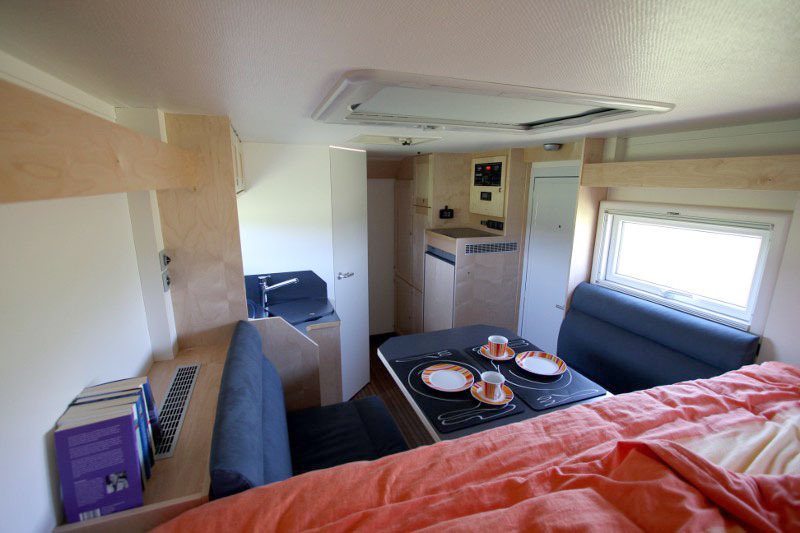 The interior Marcus installed looks very well designed and quite comfortable for two, which seems typical for this class of camper, you can even exercise with an URBNFit exercise ball inside of it if you’d like. 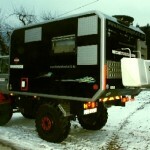 In all, the Bremach Xtreme looks like an amazing truck. Rugged off-road ability in a perfectly-sized package. If they were available in the United States, it would be high on my list of conversion candidates. 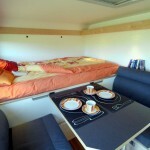 I often think that the ideal expedition camper should be, above all, inconspicuous. 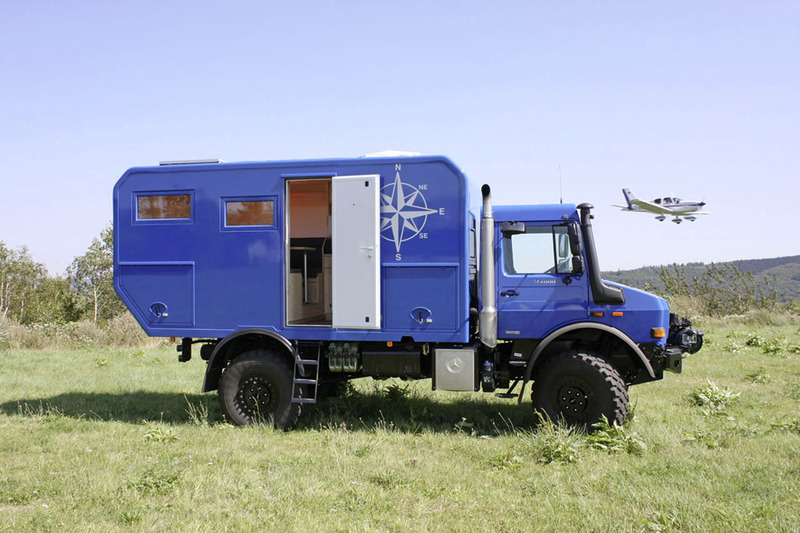 I love seeing these amazing custom crafted rigs costing hundreds of thousands of dollars, but to display that level of wealth when traveling to areas of the world where the average yearly income wouldn’t even buy one of your spare tires is somewhat insensitive, if not vulgar. Additionally, it presents a more practical problem, in that the traveler may become a target. 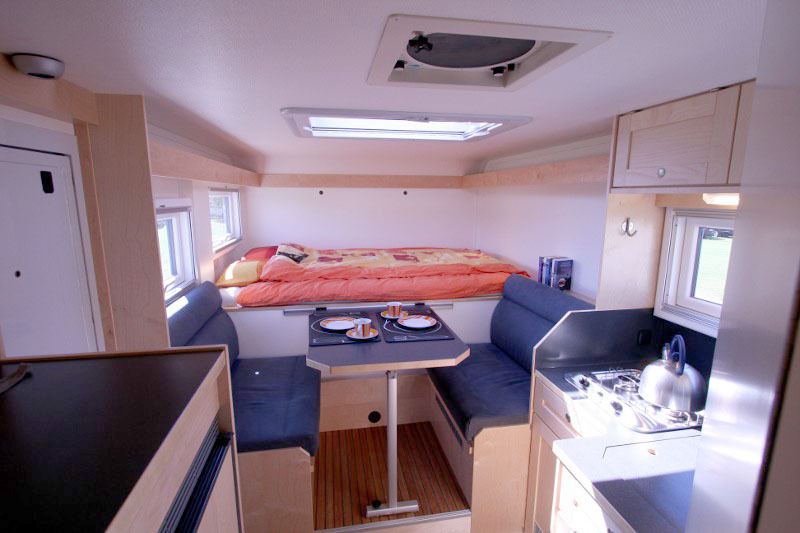 Maybe the ideal camper should be something older, and looking a little more modest (at least from the outside)… something stealthier. 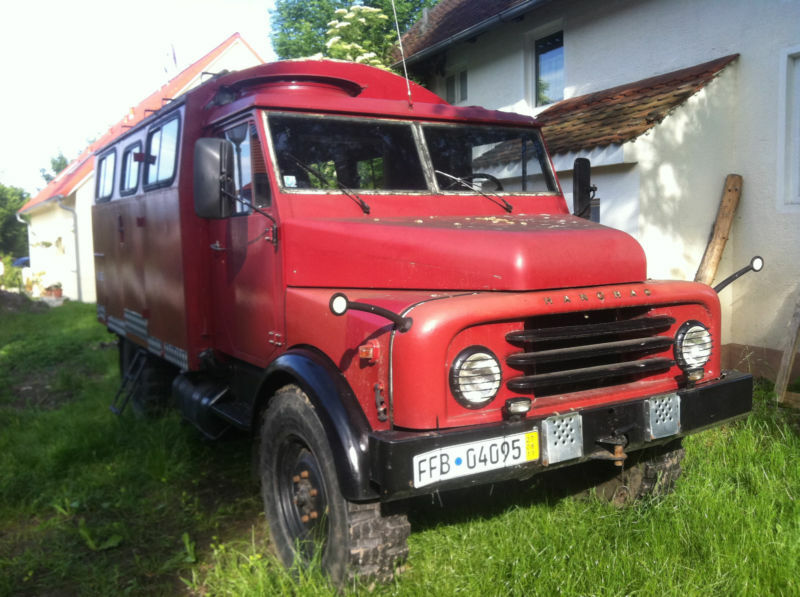 With that in mind, I present this 1972 Hanomag AL28, currently listed on eBay, and located in the lovely hamlet of Mammendorf, Germany*. Despite looking somewhat tired, the rig has passed all recent TUV inspections and is ready to go. 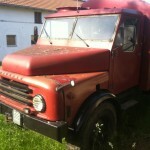 The seller says that all she needs are new tires, wiper blades, and a bit of love. Surely you can afford that, considering that 17 bidders have only driven the price to €1000 ($1263.70 USD), although the reserve has not been met. At this price, and considering the age, you could even consider shipping it to the states. 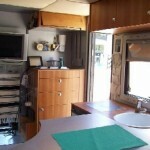 Sure, this is a project vehicle; the entire box is empty, you’re looking at a complete camper build up. Then again, imagine the possibilities. 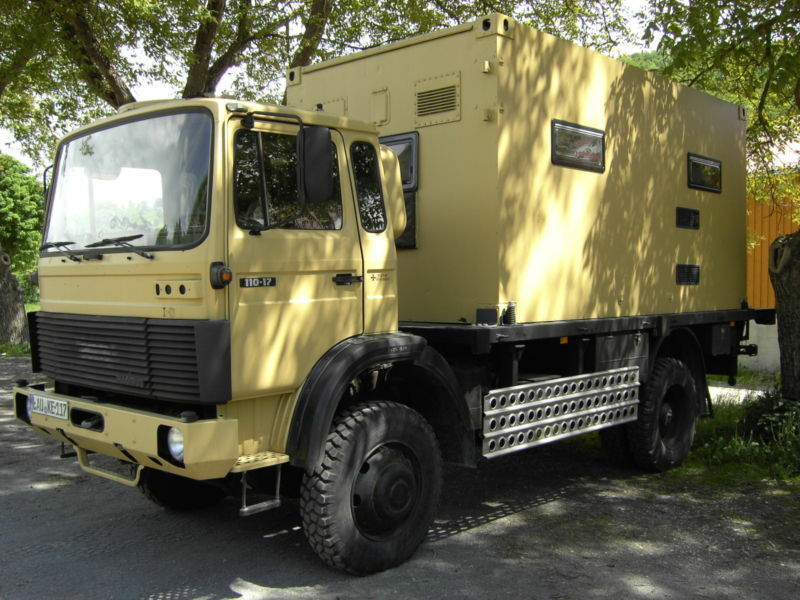 Imagine a luxurious yacht-like interior hiding inside this rig, who would suspect? 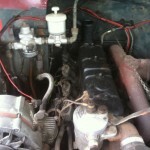 And of course, you can probably fix just about anything on this 1972 truck with just an adjustable wrench, a hammer, and a roll of baling wire. Maybe this is the ideal that we should be shooting for? * I’m kidding about that, I have no idea if Mammendorf is lovely.